I have tested various screen capture products in the past, always looking for the free version. It's a request I often get where an academic requires some form of screen capture in order to incorporate a vodcast as part of their repertoire of teaching materials for the VLE, a virtual learning environment or simply as a video tutorial. I have used Adobe Captivate, TechSmith Camtasia Studio (very good) but these are all pay versions. What about free ones? There are those in various guises, some very basic like CamStudio which works well, however, as a user you have to know your video codecs to get the best out of most, and other ones are typically locked down with limitations. One of the better free versions I have come across is kindly provided by Microsoft, called 'Expression 4'. The main limitation for the free version appears to be the 10min capture limit. Personally I don't think that is bad at all, as it gives most people time to take a breath and record a new section, each segment can be assembled together later. 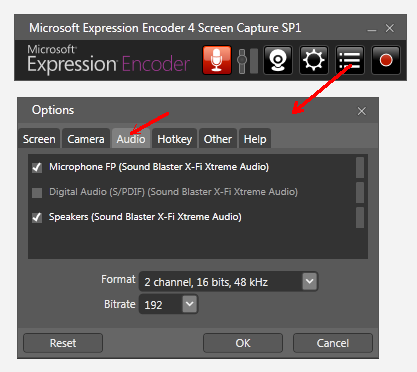 The Capture interface provides: microphone on/off, main volume control, webcam (if you have one), settings, your previous capture list, and of course the record (as shown above). When selecting the record option you are presented with an area to capture, either full screen or custom. Choose the audio you want to capture! To add to this arsenal of tools, I must not forget the excellent free Windows Live Movie Maker (Windows 7 and greater), which all adds up to some pretty powerful tools for editing an creating professional teaching and learning videos. 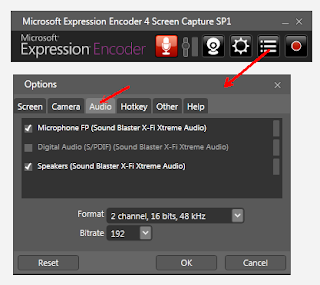 Output your screen videos from Expression as WMV, you can then easily drop them straight into Movie Maker timeline, add titles, streamline and then upload straight to your YouTube. Of course it also has options to create stand alone WMV or even produce your own DVD if you want to go the whole hog.